Quite a long drive out west yesterday to cycle along the Thames and Severn canal. This is an old, abandoned canal, now badly overgrown, but the towpath is still good, and that's where I was going. I started near Chalford, because it was near the middle of the T&S, and I went east. I intended to get back to the car, restock, and then go west, but in the event, it was 6pm when I got back. So west will be some other day. When I got to Sapperton, I biked along to Coates, then around to Tarlton, and up the byway, then to the Sapperton railway tunnel (I followed its route aboveground, and saw the air shafts). Then a few more kilometers got me back to the car. The caches were mostly easy, but quite a few difficult ones, and I had a few DNFs. The going was quite good, but in places the track was quite iffy. And I was biking along with the canal on one side, and the river Frome on the other, sometimes without much clearance for the track. I used the new Hobbyking batteries entirely, and I got through almost three of them (at 5 AH each, half the nominal capacity of the old batteries). I was getting about 11km per battery. But I couldn't tell how many AH I'd used, because my new Hobbyking amp-hour meter, shows volts, amps, watts but not amp-hours (or even watt-hours), which the web page said it did (and so does the label on the back of the device). I've asked them how to make it show AH; failing that, I'll ask for a refund, because if it doesn't show AH, it's no use to me. At about 4:30, I got out my head torch. It's really bright, and it's almost like cycling along in daytime. And I have a slot for a flashing red light at the rear of the bike, which hopefully will make sure that cars see me and don't run me down. But apart from the niggle of the meter, I'm really pleased with how the HK batteries performed, and how light they are compared with the old batteries. I took four (that's four pair) out with me on the trip, and used 2 3/4 by the time I got back to the car, after travelling about 30 km. I have six pair altogether now (the replacement for the dud one arrived today), so I'm confident that I can do a full day's biking, no matter how far I travel. The area is quite hilly. Of course, following the canal was very level, but when I got away from the canal, it was very up-and-down, and I was very glad of the help from the electric motor. 33 caches found and a few DNFs. 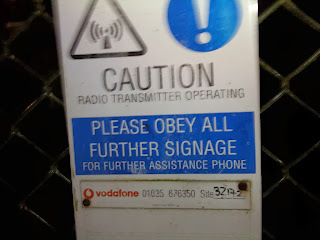 I obediently looked around, hoping for further signage that I could obey, but couldn't find any. 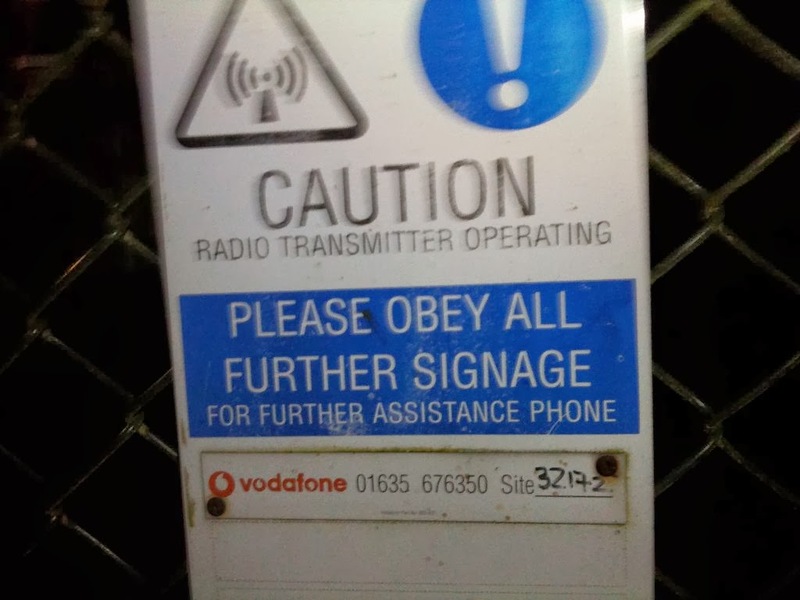 I'm not sure what is the point of this sign (or as the author of the sign would call it, signage).